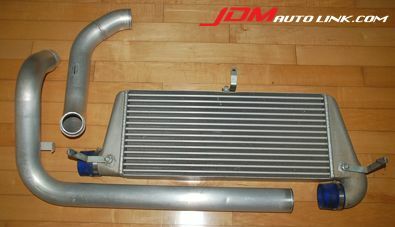 We have a mint condition Blitz Intercooler Kit Set for the Nissan Skyline R34 GTT and R33 GTS-t. The intercooler kit set come complete with aluminum piping, brackets, silicone hoses and all the necessary hardware. 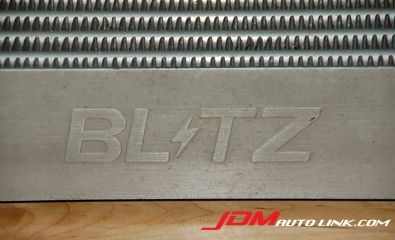 Blitz intercoolers are designed to flow considerably more amount of air than the stock intercooler by consistently and rapidly drawing away heat. With its tube and fin design a much greater cooling effect is achieved. A cooler airflow intake means a more dense charge of air, which in turn creates more horsepower. This reduces thermal stress to the turbocharger components and produces gains throughout the powerband. The intercooler fins are in excellent condition with virtually no collapsed fins. A must for those ECR33 and ER34 owners out there. Email us at sales@jdmautolink.com should you be interested.